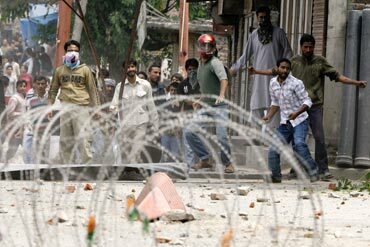 Rediff.com's Jammu and Kashmir correspondent Mukhtar Ahmad explains the contours of the present unrest in the valley. There has been widespread violence in Kashmir in the last few days as separatist leaders continue to capitalise on the unrest among the youth in the state. The failure of the peace process between Centre and the separatist leadership, as also between New Delhi and Islamabad, to throw up any concrete solutions to the over six-decade long problem of Kashmir has generated a backlash among the local youth who often target police and paramilitary forces with rocks and stones. The valley has been under curfew for four days now. What triggered the recent outburst? The deaths of 14 teenagers and a youth since June 20 in firing by the Central Reserve Police Force and state police have triggered a cycle of violence in Kashmir. Civilian protests against what is alleged to be excessive use of force by the paramilitary personnel during clashes with stone pelters sustain a vicious cycle during which more casualties occur and violence continues to haunt the state. Click NEXT to read more about the first civilian death in the valley.. When was the first civilian death reported this year? The first civilian who was killed during this year was Whamiq Farooq, 13, who died on January 31, when protesters clashed with security forces in the Rajouri Kadal area of Srinagar. If the incident occurred almost six months ago, why are the protests still going on? The cycle of violence triggered by one civilian death results in protests during which more casualties occur and the ball keeps on rolling. 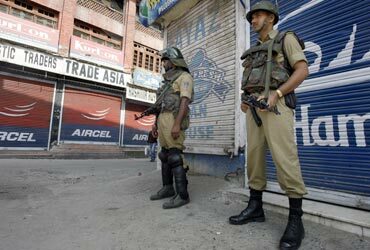 How many bandhs has Kashmir witnessed in the last two months? Roughly, in the last two months, there have been 20 days when markets, educational institutions and banks have remained shut due to a shutdown. 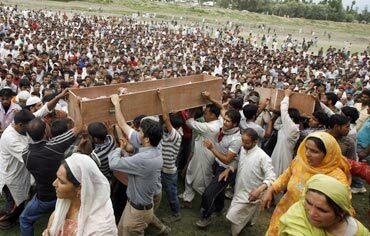 What are the Kashmiri people demanding? The moderate All Parties Hurriyat Conference has put forth demands that include removal of paramilitary bunkers and troops from all cities and major towns of the valley. They have also demanded the release of the youth arrested during clashes with the security forces and repeal of the controversial Armed Forces' Special Powers Act which gives sweeping powers to the deployed troops in the valley. Why is the CRPF running amok in Kashmir? Everybody talks of a political solution to the problem -- what is the solution envisaged? The separatists are demanding a political solution that satisfies the aspirations of Kashmiris through tripartite talks between India, Pakistan and the representatives of Kashmiris. Why is the CRPF running amok in Kashmir? Why is the local police not being used in operations? Both the local police and the CRPF act in tandem while dealing with the law and order situation in the valley. 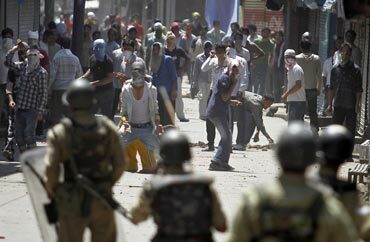 The CRPF has been accused of using excessive force since they are in the forefront of crowd control operations. The unprecedented violence that occurs during such protests is often tackled by the CRPF and the local police by firing at the crowd. 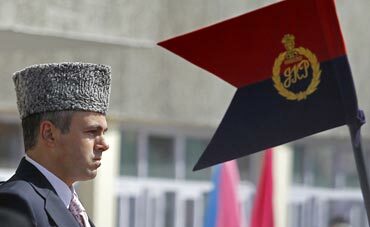 Is the task beyond Omar Abdullah? What is J&K Chief Minister Omar Abdullah saying about this? The chief minister has said the time has come when a political dialogue needs to be started between India and Pakistan and also between New Delhi and various shades of opinion in Kashmir to reach a sustainable solution to the problem. He also said that no amount of economic development and prosperity would ensure peace unless matched with a political initiative. The chief minister, who heads a coalition comprising his National Conference and the Congress, is fully backed by New Delhi to deal with the situation. The task is definitely not beyond Abdullah as long as he has Delhi's full backing to steer out of the present turmoil. Omar Abdullah had already starting reaching out to the people through interactions with the civil society in violence-hit areas. He has held such interactions in Srinagar, Baramulla and Anantnag. The government is hopeful that these interactions would instill confidence among the people and help restore order in the Valley.